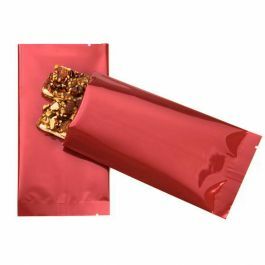 Measuring 3" x 5 1/2" this SVP35HG metallized heat seal bag is shimmer gold in color, so you can package ground coffee, powdered mixes and edibles in style. This 2.6 mil, high barrier bag is durable, featuring a 1/2" bottom seal and a 5/16" back-center seal. Heat seal to close. Food safe. Our SVP35HG is our metallized heat seal bag in shimmer gold. This 2.6 mil bag that measures 3" x 5 1/2" is perfect for powdered mixes, supplements and edibles. 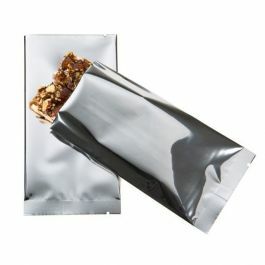 As part of our line of metallized heat seal bags designed with our highest moisture barrier, this bag keeps granola, dried fruit and nuts fresh while protecting against UV light, moisture, and oxygen. Tear notches are featured at both ends of the bag for easy opening. The bag is open at the top (width side) for easy filling. It has a 1/2" bottom and a 5/16" back-center seal. Food safe. Our SVP35HG is ideal for packaging items like ground coffee and powdered mixes.